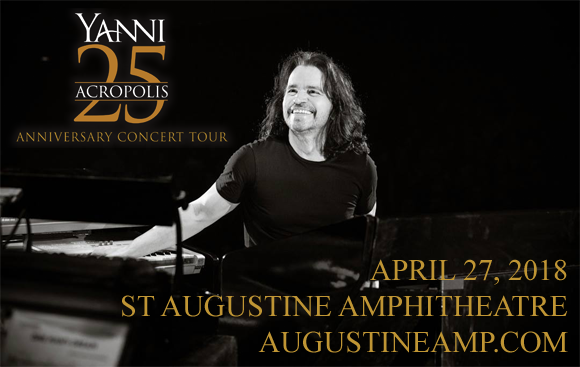 Yanni comes to St Augustine Amphitheatre on Friday 27th April 2018! Touring across North America to promote the twentieth anniversary of his world-renowned concert, Live at the Acropolis, the legendary composer and instrumentalist will be performing with a full symphony orchestra! Don't miss your chance to see this global phenomenon! Greek composer, keyboardist, pianist, and music producer Yanni wowed the world with his 1993 concert Live at the Acropolis, which went on to become the second best-selling music concert video of all time (after Michael Jackson's Thriller), selling more than seven million copies worldwide. With a career that has spanned over four decades, Yanni has sold over twenty five million albums worldwide, and has achieved either gold or platinum status forty times globally. His unique blend of jazz, classical, soft rock, and world music has led him to perform in over thirty countries on five continents. He has released seventeen studio albums and five live albums to date.